There are many blessings to painting in Northeastern NC. There is a big sky over sandy soil and vibrant water, and all of these things play with the light. There is a noble–and quirky–built environment, rich in handwork. And there are people, both resident and visiting, who value these things. At the Cupola House benefit mentioned in the last post, I met many who are alive to the beauty of this part of the world. Many thanks to the Cupola House Association and my patrons. And thanks, too, to those who brought me vulture quills from St. Paul’s churchyard while I was painting there. I was fortunate to approach this scene in the spring when the new greens offer such contrast with the old house. Thanks to Emmett and Bobby Winborne who allowed me to paint their birthplace. This painting grew from a sketch, a study and a rendered drawing. I felt like a gardener before spring, transplanting little seedlings from pot to pot as I drew, measured, enlarged, and painted. Each time, I trusted the image to materials I made myself. It is satisfying to brew one’s own ink, cut panels, dissolve rabbit-skin glue and dust for gesso. Taking handmade materials outdoors makes one look more acutely. One of my teachers, Nathan Bertling, used to tell me, “If you love your paper, you’ll love your drawing.” He meant that time spent in preparation makes for good execution. 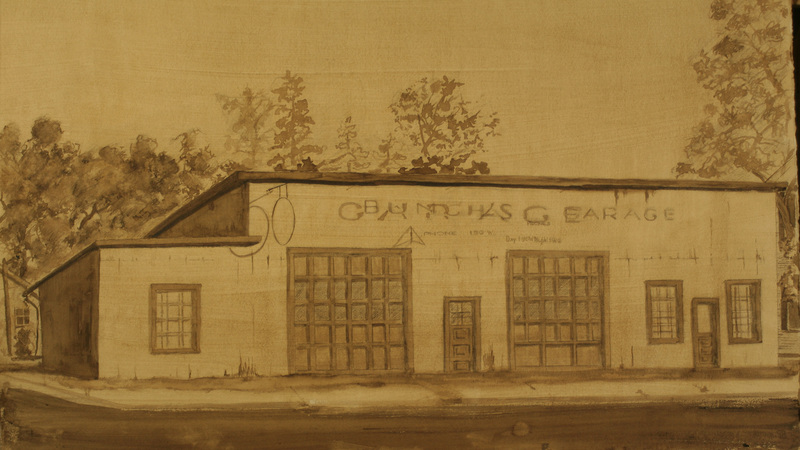 Below is the 24 x 36″ large study I did for Harmony in Green, an early 20th-century auto garage in Edenton. It will hang my solo show there on Dec 4. In the Renaissance, most preparatory drawings for paintings were done in chalk. This is a great way to indicate quickly where things go in the composition Such drawings look like this one, which took about twenty minutes to do. 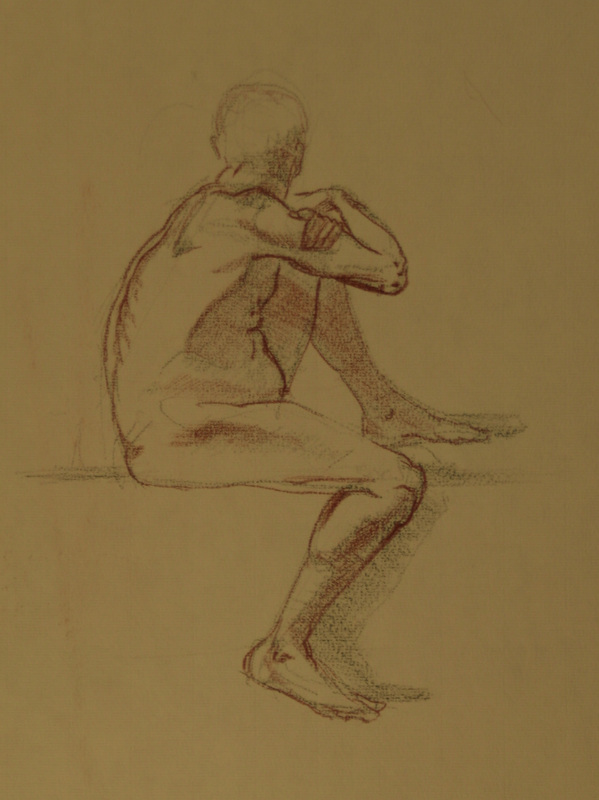 Chalk is smudgy for shadows and holds an edge for sharp lines; hence, one can capture a lot of information with it. But to test out large blocks of light and shadow, one turns to ink. Since we live a century into the era of comics and posters, it’s nothing for us to look at a poster and register an image. Most poster- or comic-style drawing, though, is a very efficient shorthand, which purposely omits reference to the third dimension. If you were busy perceiving depth in a billboard, you couldn’t read that billboard while driving. In short, what we spend in depth perception, we gain in information. Non-realistic pictures are worth a thousand words, as marketers the world over agree. Yes, this is realism, albeit at its most stripped-down. No one doesn’t like these Renaissance robots. 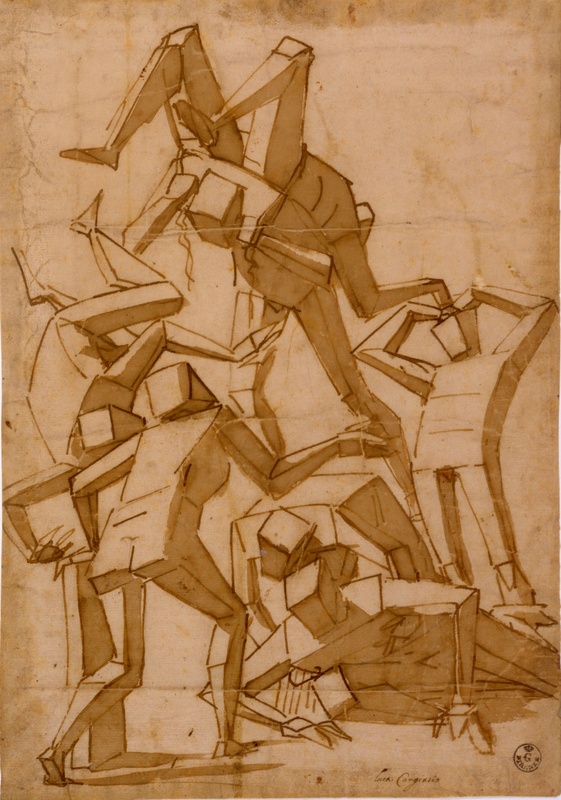 Just the act of breaking these abstract figures up into front (lit) planes and side (shadow) planes gives them life. This is simplicity: a little doing a lot can make for a monumental effect. If you remember Genesis 1–or any other creation myth, for that matter–you have already noticed that life will not go where there is no form. So here’s the same treatment applied to a 24 x 36″ study of the building I’ve been working on. A little doing a lot over two square yards. The ink is walnut ink made from the bounty of North Carolina, and the pens used in the drawing are reed pens, just as Cambiaso used. First, I corrected the date given for my show in Edenton next month. It is now to open on Thursday December 4th. The time remains 5:30pm. The volunteers who run the Chowan Arts Council Gallery didn’t want the show to conflict with the lighting of the town Christmas tree. 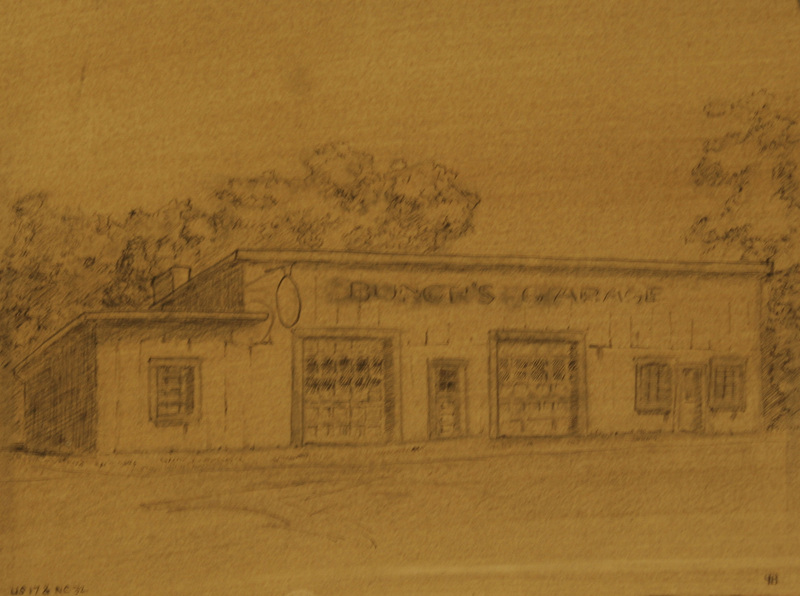 Bunch’s Garage, study. Walnut ink. The rhythm of verticals in the building’s fabric makes a strong contrast to the contorted oak forms behind. I chose a prepared paper to catch the sense of atmosphere that nourishes the trees and ages the building, because, for the time being, the structure’s age contributes to its dignity. I also abandoned the brush, intending to suggest brittleness with the use of goose and steel pens. Making a drawing out of a million tiny lines demands an upped tempo and a light touch at once. It asks both draftsman and viewer to see with two faculties that our historical moment hates: aggression and restraint. On Thursday, December 4, I’ll show 30-some works in oil and ink at the Chowan Arts Council at 504 S. Broad St. in Edenton. 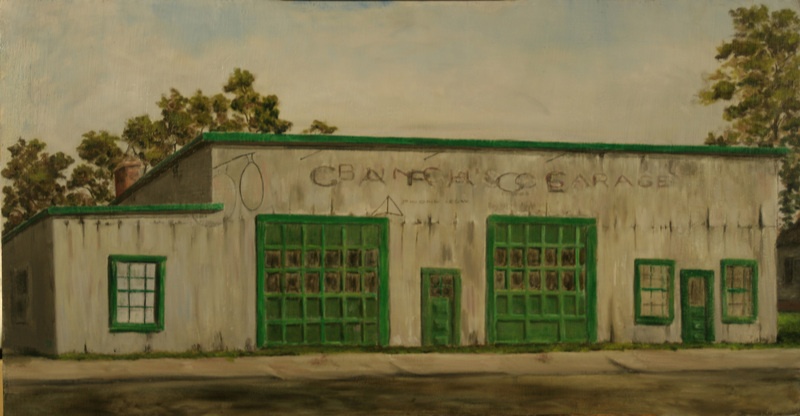 The show is titled Wide Open and features the overlooked landscapes of North Carolina’s Northeast. This is a land of forgotten explorers, a four-and-half-century history of visual art, small Indian tribes, and big skies. Between now and then, I’ll offer previews of some of the works and reflections on the places that inspired them. 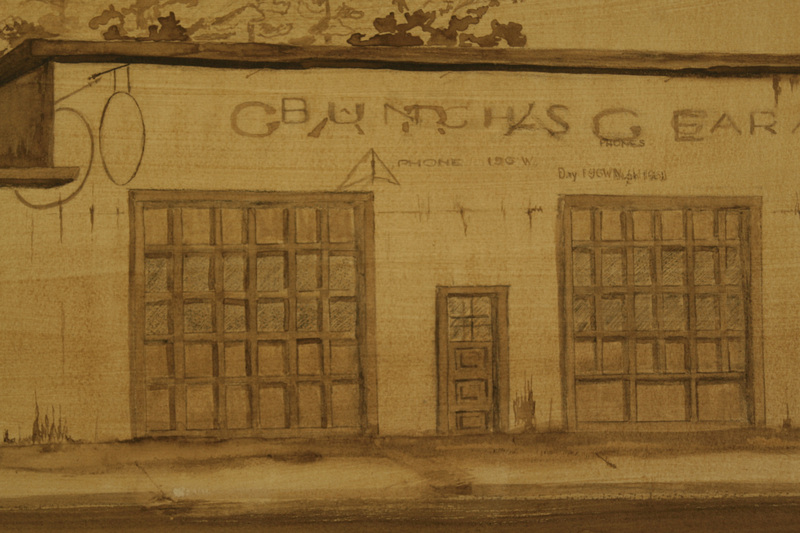 The little sketch below grew into a study, a 2 x 3′ rendered drawing, and a painting almost as big. 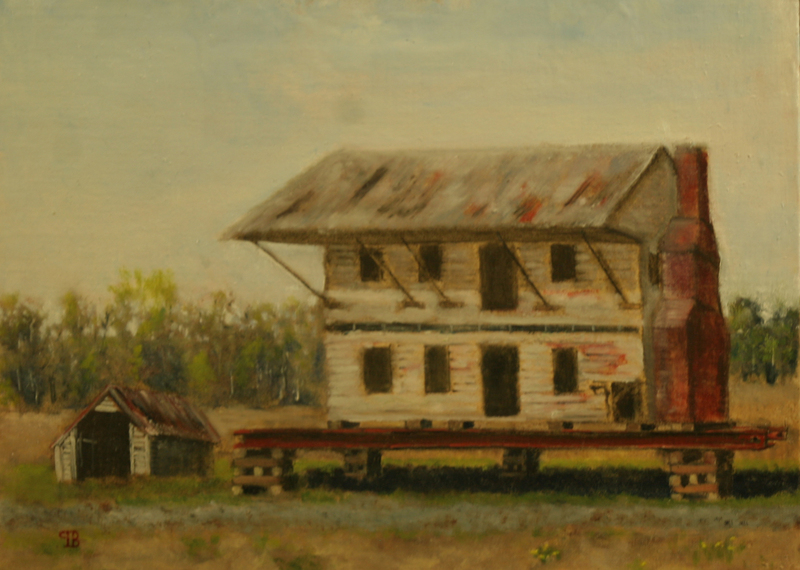 On December 5th at 5:30, I’ll have a one-man show of about 30 works at the Chowan Arts Center in lovely Edenton, NC. That’s in the northeastern part of the state. In the show, I’ll focus on a world that has gone unnoticed since the expeditions of Walter Raleigh and that was already legendary at the time of the first permanent English settlement in 1607. The CAC sits at the end of Broad Street on Edenton Bay where nature meets a small eighteenth-century town. Few places in the South so handsomely reward a visit. In case you can’t make the trek, I’ll post the contents of the show on the site after it opens. In addition, I’ll post some studies for larger works as I make progress with them as well as details of finished pieces as they come. For now, the sketch above, done with a reed pen and a brush. I drew it because I liked the rectangles struggling to keep their shape despite the passage of time. It spawned a medium-sized drawing done with three pens and walnut ink that played up the texture of the sheet-metal building and the lacy disposition of the oak leaves behind. Next will come a 2′ x 3′ ink drawing dwelling on the building’s trim and the paved surfaces below. Last, I’ll do a large oil painting that ties together the elements just mentioned. I’ll also relate the the greens in the building’s painted trim and moldy siding to the greens in the trees. What began as a musing on shapes has turned into a sustained color study, and a meditation on nature and culture. Here is one of the charms of a painted scene; things appearing winsome or repellent in isolation find new homes, new relationships, and new meanings when someone pays them enough attention.